The launcher was built to allow safe launching by a child. The pull of a string, and off it goes. 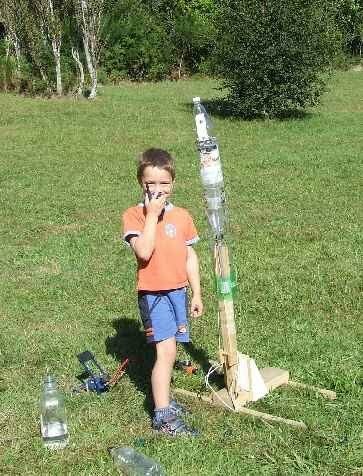 This allows children to stand back at a safe distance while the rocket is pressurised. My launchers use hose fittings to match the rocket nozzle. Originally plastic fittings were originally used, but these didn't last long, so now metal fittings are used. At the base of the launcher is a spring loaded lever. Bungy cords are used for the spring. This is sprung backwards against a stop such that when pulled a small way forwards past its centre point (by the launch string) it flips down and pulls the string to open the hose fitting release.